Michael Collins walked in space on Gemini 10 and circled the moon as Apollo 11 Command Module pilot while America’s first moonwalkers explored the lunar surface. He was born in Rome, Italy, on Oct. 31, 1930. He received a Bachelor of Science degree from the U.S. Military Academy in 1952 and attended an Advanced Management Program at Harvard Business School in 1974. After West Point, Collins chose an Air Force career and served as an experimental flight test officer at the Air Force Test Center, Edwards Air Force Base, California. 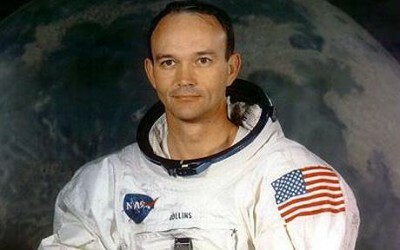 Collins was selected as an astronaut by NASA in 1963. As pilot of the three-day Gemini 10 mission, launched July 18, 1966, he and commander John Young docked with an Agena target satellite and used the Agena engine to maneuver near another Agena left in space by the Gemini 8 crew. Collins stepped outside and, using a jet gun he moved over to the second Agena and recovered a micro-meteorite detection device attached to its side and returned it to earth for study. While Neil Armstrong and Buzz Aldrin took their historic first walk on the moon in July 1969, Collins flew a “lonely lifeguard” assignment for more than 24 hours, waiting for them to launch their lunar craft and rejoin him in moon orbit. He retired from the Air Force as a major general and left NASA in 1970. He served briefly as Assistant Secretary of State for Public Affairs and then became the first director of the Smithsonian Institution’s National Air & Space Museum, serving from 1971 to 1978 and overseeing its construction and development. It was the first major government construction project in Washington completed on time and under budget in several years. He has written several books about space, including “Carrying the Fire”, “Liftoff”, and “Space Machine”. Michael Collins was inducted into the U.S. Astronaut Hall of Fame on March 19, 1993.